A Crown agency of British Columbia, BC Innovation Council (BCIC) delivers programs and initiatives that promote company growth, resulting in jobs, increased revenue and economic development in B.C. Building a business plan, networking and raising the money to offer competitive salaries are just some of the challenges Saber Miresmailli has met since founding his North Vancouver-based startup, Ecoation Innovative Solutions. But support from the BC Innovation Council—a Crown agency dedicated to growing B.C.’s economy through technology—has helped him clear those hurdles, and build a business that is poised to change the world. Since 2010, Ecoation has been working to revolutionize agriculture by eliminating the need for pesticides. Its product, Crop Sense, is a wireless monitoring system that uses a robot to scan plants, and an app that alerts growers to real time changes in their condition. The information allows farmers to chart growth and tend to problems in individual plants before entire crops are threatened. 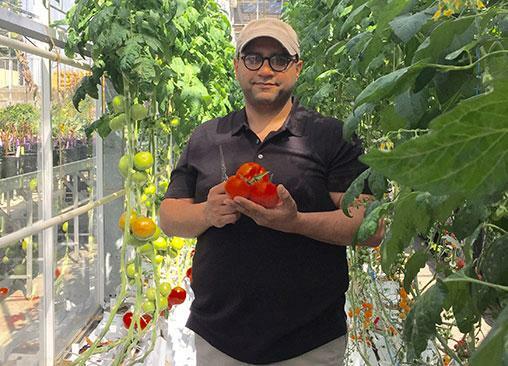 But after five years developing the technology for growing plants, Miresmailli knew success hinged on growing his team. After placing in the top 10 in the BCIC-New Ventures Competition in 2014 and participating in the Venture Acceleration Program through BCIC partners Wavefront and Foresight Cleantech Accelerator Centre, Miresmailli knew where to turn for support. Grants from BCIC topped up the salaries for three students who joined Ecoation’s team in 2015—one of whom made a game-changing discovery. Having the ability to hire students and access young minds and fresh eyes is crucial to the success of startups, Miresmailli says, noting he chose to base Ecoation in B.C. in order to access the wealth of talent here. He believes that having the resources to hire the right people with the right ideas at the right time has given Ecoation a competitive edge. “The impacts are huge because it allows us to hire now and basically make sure we are successful,” he says.